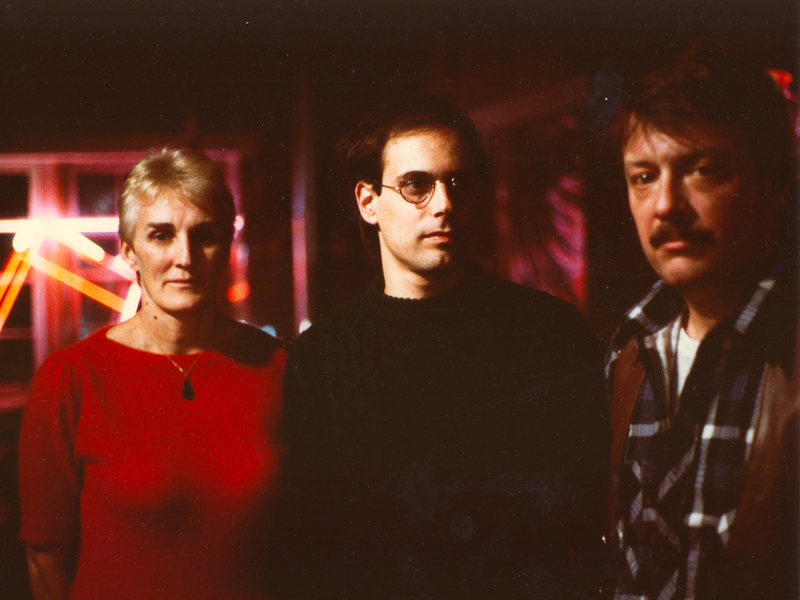 1985 – Four-part evening-length space odyssey (Part I: Departure; Part II: Quest; Part III, Domain; Part IV, Rites/Skylight/and Departure) of choreography that takes place inside a large-scale installation of argon laser beams created by Rockne Krebs and Synclavier II music by Bob Boilen. Laser beams originating from upstage center and project toward 50 mirrors placed in Lisner Auditorium walls and on stage. 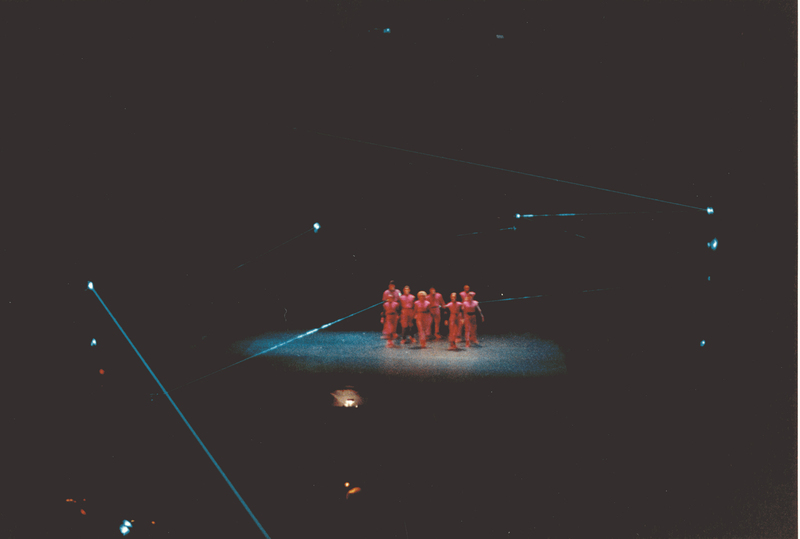 When the beams are interrupted (human body or stilts) the visual grid of beams would be altered on stage and above the audience in the house. Sound installation by Bob Boilen with Synclavier II electronic instrument is a riveting score, generously enhancing the choreography by Maida Withers. 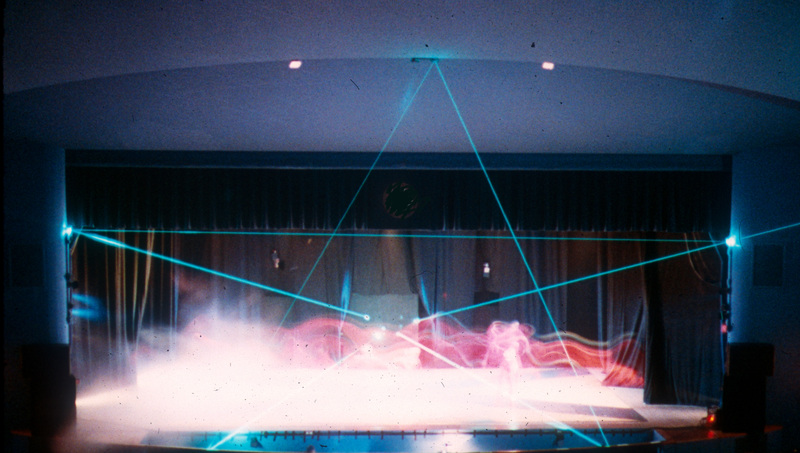 Laser Dance (23:30 min) was shot on 16 mm film due to the darkness required for laser light to be seen. Video shot and edited by Linda Lewett. "It's a bold, imaginative, frequently striking, decidedly space-aging enterprise. If, in the end, it remains something of an enigma- its intentions and theme elusive, the logic of its unfolding only intermittently convincing..."
"The multiple media of "Laser Dance" are interdependent and interactive. As the dancers move,flanked by the lasers and surrounded by an ocean of sound, their bodies intercept the light beams, and thereby trigger prerecorded shifts in the synthesized music." General and long ariticle about Maida Withers - an interview during the time Laser Dance was being constructed. "Maida has identified the "raw physical motion" of dancers as the central force of her work. She structures this in intricate ways. Dancers are her main collaborators, but she has often asked poets, visual artists and musicians to contribute to building a piece. ..."Movement flows out of me excessively rapidly. I have more movement than I can choreograph. I work knowledgeably. I know how I want it done. My instinct is always just to become enamored in the work, and not necessarily how well it is going to work for the audience. ..."In reflecting back, sometimes I get really choked up, and I wonder what I have done and what this means. If it means anything." Maida Withers, D.C.'s Dance Revolutionary. Laser Dance: A step into the interarts arena. 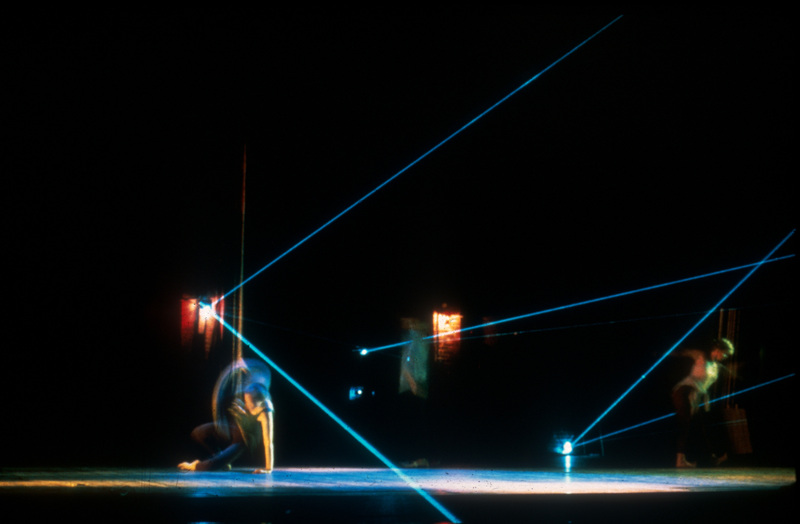 "With the premiere of Laser Dance last Thursday night at Lisner Auditorium, a collaborative effort between Krebs (laser sculptor), choreographer Maida Withers and musician Bob Boilen, Washington art has stepped resoundingly into an interarts arena which until now has been almost exclusively the domain of the New York avant-garde." "This movement (second movement) opened with the dancers awkwardly traversing the stge on red and blue stilts. This was followed by a series of rightly choreographed interactions here the stilts were employed in a number of imaginataive ways: now appearing to be weapons, now musical instruments, now extensions of the dancers themselves."